Ahsoka has this new look since season three of the clone wars. How she looked when she was in the first 2 seasons is below. She is 14 or 15 in the first two seasons (below) and 16 or 17 in season three (above). 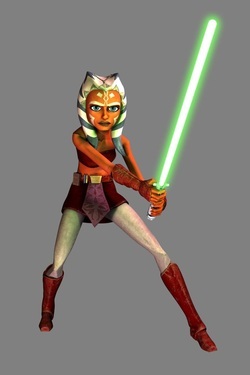 Ahsoka Tano, nicknamed Snips by her master, was a Togruta Jedi Padawan during the Clone Wars, the conflict between the Galactic Republic and the Confederacy of Independent Systems. Tano was assigned to Jedi Knight Anakin Skywalker by Jedi Grand Master Yoda, and showed an eagerness to prove herself worthy to be his apprentice. Tano was involved in the defeat of the Separatist army on the planet Christophsis, and was important to Republic efforts during the Battle of Teth. Along with Skywalker, Tano was instrumental in acquiring the Republic's safe passage through Hutt Space, due to her part in rescuing the son of Jabba the Hutt, which ensured an alliance between the Republic and the Hutt clans. Along with her Master, Tano proved a key figure during the events surrounding the Separatist superweapon, the Malevolence, a ship capable of destroying entire Republic fleets with its dreaded ion cannons. Partially due to her involvement in the crisis, the Republic was able to destroy the superweapon, removing yet another advantage possessed by the Separatists. Later, Tano would duel the feared General Grievous himself, becoming one of the few Jedi to survive such an encounter with the cyborg. Secura during the Sky Battle of Quell, and later participated in the defense of the planet Maridun, where Separatist General Lok Durd attempted to use an experimental weapon on the planet's inhabitants. Notably, Tano helped to ensure that the deadly Blue Shadow Virus was not released into key Republic systems by the Separatists, and also fought in the Battle of Ryloth, helping to eliminate the Separatist blockade surrounding the planet and allow invasion forces to land, during which she led a squadron for the first time. Later on, Tano was assigned to guard duty in the Jedi Temple's Archives after her mishap on Felucia. However, she and Skywalker went to hunt for deadly bounty hunter Cad Bane at Devaron to retrieve a stolen Jedi holocron. Then, the two halted a plot by the Sith Lord Darth Sidious, who was secretly Supreme Chancellor Palpatine, to twist the minds of Force-sensitive infants for service in the future New Order. As of yet it is not known if or how she survives the clone wars. For more information on this, visit our forum about this topic.